I was in the front lobby today talking with one of our customers and she said “I think my iPhone is a cement magnet“. This was her 3rd trip into Mission Repair on the same phone to have the screen repaired. Please remember that these phones have GLASS screens, and I know that this customer is fully aware of the problems of dropping her iPhone…but other customers don’t really think about it until it’s too late. We all make mistakes; but this customer keeps coming back to Mission Repair because of our exclusive “Got Repair” benefits that come with each and every repair. This means that if you have your iPhone fixed with us, and if you ever drop and break it again, you’ll never pay full price again. We are the only repair business in the industry to offer this, not even Apple themselves will touch this benefit program. Some customers ask “what’s the catch?” There is none. It’s just something that we do at Mission Repair that continually sets us apart from the rest of the market. Want to learn more about our “Got Repair” program for screens? Click here! Device broken again? We repair it for less the second time. We at Mission Repair know first hand that mistakes can happen more than once. This is the very reason, we created “Got Repair”! Many of our customers would leave happy, just to come back a year later to pay full price for the exact same repair service! This problem didn’t sit well with us. So in true Mission Repair fashion, we did what we do best, fixed it! 1. If you come in for an iPhone 5C Front Glass repair (original price $109) we will perform our award winning repair service on your device and get the unit back in your hands. 2. Then, at ANYTIME in the future you need to come back in for the same repair, we will repair it again for less! In this case, we would repair the iPhone 5C Front glass again for only $55. Note: This example is for the iPhone 5C Front Glass Repair. Different “Got Repair” prices apply to different repairs. Imitation is the sincerest form of flattery – again. Let’s get to the bottom of this exclusive program at Mission Repair. The number one service we perform is fixing cracked screens for many different products. Even worse, we’ve seen many repeat customers for the same repair. Mission Repair wants to stand out among the competition by offering benefits with our repairs that other businesses don’t. We’ll then perform our Award Winning Service like usual and get the repaired unit back in your hands. We are in the business of Nationwide 24 Hour Service. Mission Repair, The Intelligent Choice. I’ve said it before, imitation is the sincerest form of flattery (even when others mock me about it) and I stand by it. It does feel good that other businesses want to participate in the freedom of starting and working for one’s self. However stealing my copyrighted material doesn’t sit well with me. For your information, our “Got Repair” warranty is the best in the business, it was created here at Mission Repair by myself, and continues to be the shining point of Mission Repair which keeps us on the edge and in the forefront of the industry. We are here for you, our customers, and we’re not imposters. I encourage you when you’re shopping around to verify who you’re working with. At Mission Repair you’ll get me, my management staff, and all 30+ of my employees on your side. Have a great day, thanks for reading. Drone Delivery? Now Thats A Service Innovation! Did anyone see the “60 Minutes” special with the CEO of Amazon, Jeff Bezos? Aside from how incredible their operations are, something else caught mine and the worlds attention. 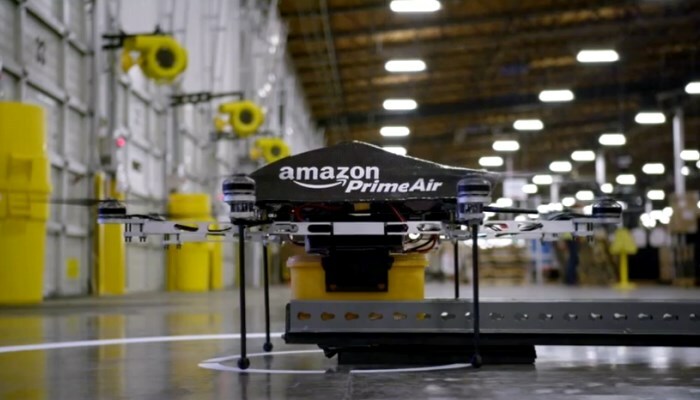 Fully autonomous drones that will at some point in the future, deliver your Amazon orders! Will there be a premium for this service? Maybe, but isn’t it worth it? Of course, this concept is still in need of research and FAA approvals, but as you heard the man himself say, “It will work, and it will happen”. Innovation in the service industry doesn’t come around too often. Yes, you see new services all all the time, but it is usually based on a new need or stemming from a new product. Rarely do you see a service innovation so great that it has game changing potential like the Amazon Drones. Mission Repair is a service industry. We offer a service that is greatly needed across the United States. Everyone once in awhile, we are lucky enough to come up with a great service idea that is a potential game changer. A couple years ago, we did just that with our “Got Repair” benefit! Over the last 2 years we have been able to save THOUSANDS of customers from having to pay full price on their already repaired iPhones, iPads, Apple Laptops, Chromebooks and other devices! You can think of it as many things, but when you boil it down, its simply in place so you NEVER have to pay full price again for the same repair on that Smartphone, Tablet, or Laptop again! There is no catch. You automatically qualify for this warranty by using Mission:Repair the first time around and if you decide that you don’t want to pay the lower service fee, we will gladly let you pay full price again Of course I’m joking. If you have a company or have used a service that you are thoroughly in love with, I would love to hear about them! Email me at Troy@missionrepair.com and lets start up a conversation about innovation in the service industry!